Hereweka Garden Retreat is luxurious, self-contained, eco-accommodation which has been architecturally designed to blend in with the stunning natural setting of garden, bush and water. This boutique accommodation is self-contained, provides a delicious organic breakfast hamper and offers complete privacy. It is airy, and light, and has magnificent views from every window, and from decks on two levels. A woodburner provides cosy winter heat. The retreat is situated in the heart of Hereweka Garden, part of a 12-acre property, which is surrounded by forest, bush and water views. From the cladding of the Macrocarpa milled on the property, to the organic furnishings; Hereweka Garden Retreat has been built with both sustainability and luxury in mind. No compromise has been made on comfort, with the best quality of fittings and furnishings used throughout. The décor has been influenced by the beauty of nature, and provides a calm and harmonious ambiance. New Zealand-made eco-accredited or pre-loved items are used extensively; from the organic wool-covered sofa, to the fine porcelain dinner set. An organic vegetable garden offers fresh vegetables for purchase and free-range eggs are available. Visitors can also choose from a selection of New Zealand wines, including several organic options. Values of sustainability are further reflected in the solar water heating system and the composting flush toilet. Special attention has been given to provide luxury experience while maintaining Peter and Anna’s commitment to organics, sustainability, and eco-friendly values. 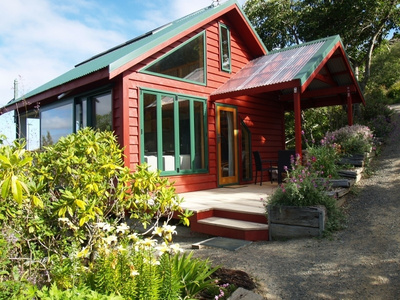 Hereweka Garden Retreat provides accommodation for two to three people. Relax in the super king bed, or two king singles, all with top quality latex mattresses, and luxury cotton sheets. Watch the sun rise over Hoopers Inlet from the comfort of your bed, then open the French doors to the balcony, off the bedroom, and enjoy the dawn chorus. 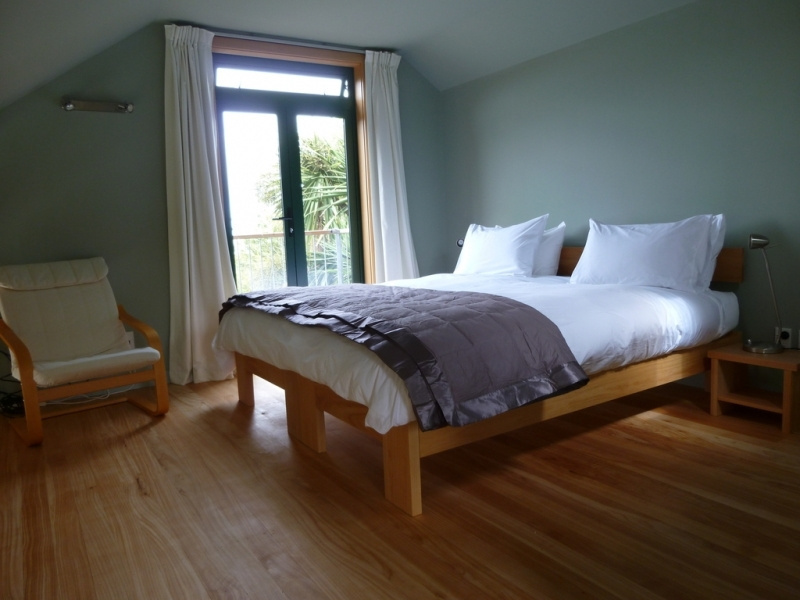 We can provide an extra bed or cot on request. Make the most of a unique showering experience; the floor-to-ceiling sliding door opens from the shower directly onto the deck, bathing you in the beauty and freshness of the morning as you wash. When you emerge from the high-pressure shower, use the luxury towels and robes. 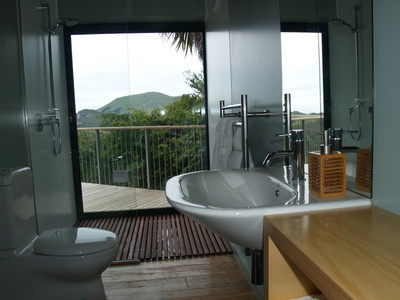 A hairdryer, heated towel rail, mirror demister, New Zealand-based eco-friendly toiletries and soap are all provided. 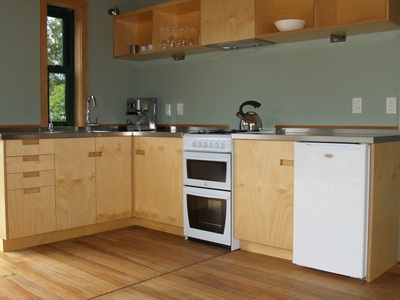 The well-equipped kitchen downstairs offers magnificent views onto the inlet where you will be supplied with fresh breakfast ingredients including homemade organic bread, jam and eggs. 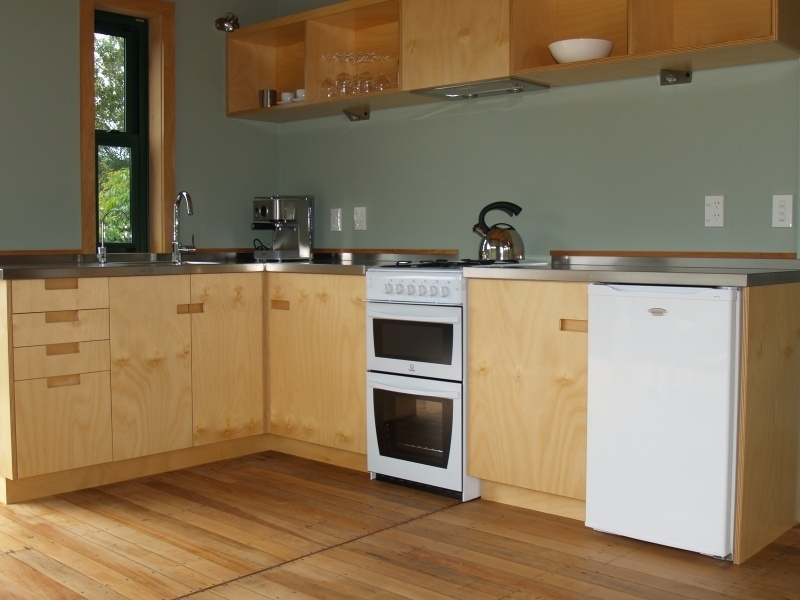 Avail yourself of the quality utensils and fixtures including an espresso coffee machine, fridge and oven, providing every facility for cooking meals through the day. Selected recycled items including the fine porcelain dinner set, linen tea towels and bone handled knives add class and quality to your experience. 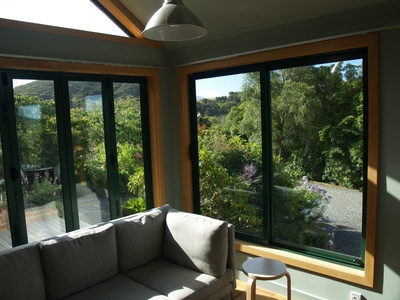 Hereweka Garden Retreat was so proud to be awarded, by the Dunedin City Council, "Dunedin’s Most Beautiful Accommodation Provider, 2013." The Retreat is surrounded by our renowned Garden, Hereweka Garden, as well as the most significant stand of bush on the Otago Peninsula. We have also been awarded 100% Guest Rating in 2014 by Travelbug awards! Qualifying for these awards is no simple task and the winners represent the very best of the accommodation operators listed on Travelbug. Hereweka has a range of boutique New Zealand wines, including organic wines, for purchase. A hamper of good quality organic produce can be ordered when booking your accommodation. Alternatively, there are several restaurants to choose from, with an excellent local restaurants, cafés and delicatessens supplying a wide range of organic produce only 5 minutes away. The local fish and chip shop won the top Fish and Chip Shop in New Zealand for 2009. Next door is the dairy and delicatessen where local honey, fresh eggs, vegetables, and locally roasted coffee are available for purchase. Super king bed with luxury latex mattress (or two single kings) complete with luxurious Egyptian cotton sheets and quality linen. Breakfast - All ingredients organic. Homemade bread, muesli, jams, chutney, local honey, fruit juice, and fresh free-range eggs. Wifi - Unlimited free wifi. 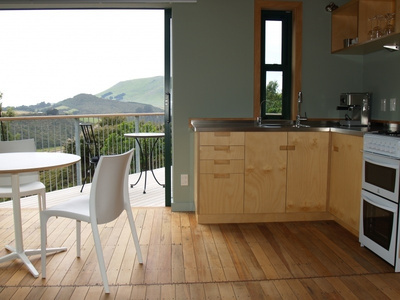 If you are looking for boutique, self-contained, luxury accommodation that is close to Dunedin, or you want to experience the nature and wildlife of the Otago Peninsula, Hereweka Retreat is the perfect choice.